My husband and my computer came down with a virus. I would love to say I was an attentive wife, spoon-feeding my husband cough syrup and soup but I paid far more attention to the computer. I have been MIA this week - no commenting, no writing and not a lot of smiling as I obsessed on playing Florence Nightingale to Harold - my geriatric computer. Harold may be outdated, but a lot of lovely plays were written on that computer and we have history. I can't save Harold but I know a lot about registry files. I was going to tie in Marlena De Blasi's lovely A Thousand Days in Venice: An Unexpected Romance with my Venetian-inspired soup. You were going to be treated to sumptuous photos of Venice and that's when Harold started sputtering. I clicked on a "creative commons license" for a photo and sent a nasty Trojan into Harold's sytem. Four days later, I am about to "wipe him out." Yes, he will be in factory condition minus all the photos, music and words that have made him sing. I will be taking away his bells and whistles. I have been putting off doing this all day. In his advanced age of 7, Harold may have to retire. I did look up once in a while to spy my pathetic husband - chilled and rolled in a blanket. Not the usual for my strapping, flannel-wearing, North-country, Midwestern man. And made variations of soup. For my husband. Harold doesn't like liquids. This is a simple soup - loaded with fish and light and brothy. It's a caress. Perfect for humans with viruses. It has enough taste to satisfy and is light enough to soothe. Use any combination of dry white wine, clam juice, water or vegetable broth for the broth. I used white wine and clam juice. In stockpot or Dutch oven, heat your olive oil. When hot, add your shallots, garlic, red pepper flakes and carrots. Saute 30-60 seconds just till softened a bit. Add your broth, wine, clam juice, etc. and boil 6-8 minutes to burn off some of the alcohol and soften the aromatics. Add your whitefish and scallops in chunks. About 2 minutes later add your shrimp. 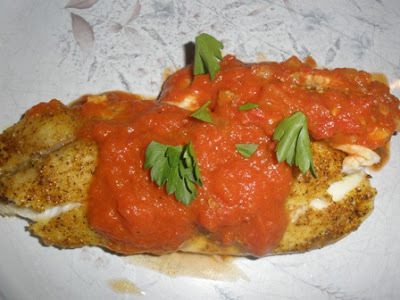 Sprinkle your white pepper and Italian seasoning and simmer untill the fish are cooked through. (The fish cooked in 5-7 minutes.) Sprinkle with parlsey and serve. If this were truly Venetian, I'd have those wonderful tiny, tiny clams as an add-in. Alas and alack, Minnesota lakes do not provide. Other ideas: Serve over pasta. make some rice on the side and add that in to the soup. Cook a diced potato with the carrots. Then read A Thousand Days in Venice - an unexpected, gutsy, honest journey back into love. The twist - the couple are middle-aged and there are bumps (he speaks little English and she speaks only "food Italian") and they will be living in his tiny apartment in Venice. Where De Blasi - a gifted cook - is dismayed to find that the local shops are happy to provide fresh bread and pastas and she is not expected to make all fresh. So says her husband. And in the course of the book, they slowly come to new agreements and carve out a life that is an unexpected as their romance. I intend to get back on the writing/commenting bandwagon soon - I have a hard time typing on the laptop (keys stick and I make a lot of errors) but Maude (laptop) is all I have right now and we will have to come to some agreements. We travel well together but I'm not sure how she feels about taking Harold's place. She has been getting dimmer and dimmer. The theme this week are "what challenges are you finding?" So I had to laugh. the virus has been a challenge. The winter - for all has been a challenge, hasn't it? And regular exercise is a challenge. But at this point I have lost 1-2 pounds a week for ten weeks that keeps me going. That and my new-obsession - invest in a new pc or a Mac? Is Mac truly better at warding off viruses? Is it worth the investment? Is pc the better value? Any thoughts? When I told my "slowly-healing husband" the cost of a Mac - I think it released a new virus into his system. And now I shall go upstairs and restore poor Harold to his original, old boring state. With a glass of wine. We also have the first Caller ID ever made. But that's just out-of-date. It's not yet vintage - but given our history of hanging on to things (Paul's 30-year old Schwinn bicycle and my swiping my mother's first mixer - with a grinder - because I couldn't bear to see it get tossed) someday the Caller ID, too will be vintage. As a teen who loved to play in Vintage Greenwich Village - I haunted second-hand shops for clothes from the 1940's. My excuse to "go to the Village." Greenwich Village was filled with scents of incense, shops with posters stating, "War is not healthy for children and other living things." And everywhere you turned there were vintage shops - selling secrets of the past. I'd walk Washington Square seeing Henry James at every turn. Clement Moore was across from the old (vintage?) Balducci's. I memorized Jack Finney's Time and Again wondering how I could find someone to send be back into New York's history. The peek into NYC's past has been replaced by Ralph Lauren and designer cupcakes. I still seek the answers to the future from the whispers of the past. Times were precarious then. Times are precarious now. My safety net was the dinner table. If we could almost always come together at the dinner table, this was something stable in my world. This was bridging the past with today and setting the stage for a future. Using a recipe from the past brings solace. 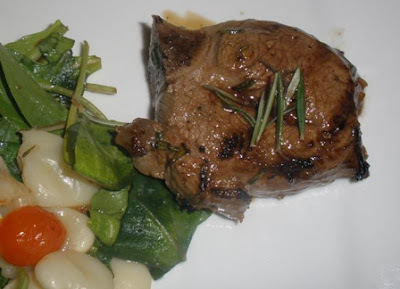 A lamb chop prepared the way my grandmother prepared it in the 1890's in Stigliano evokes her grittiness and my lack. As we eat the lamb chops amid a snowy, frigid Minnesota winter, I am at so many dinner tables. I'm at my home in Queens as an anxiety-ridden teen, at Aunt Fay's meldodramatic dinner table (I'll cut your heart out if you don't eat!") and sometimes I'm in the poverty-stricken mountains of Basilicata with Grandma and her siblings. They're speaking in dialect and they're arguing. And using their arms descriptively. Marinate the lamb chops (two-eight hours before cooking). 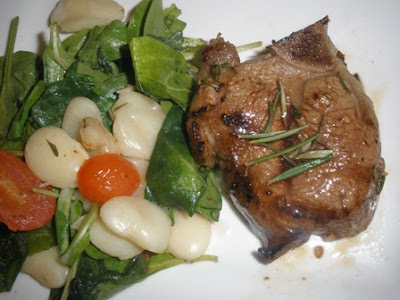 The vinegar adds just a tad of sweetness as the rosemary, garlic and oil permeate the chops. Put lamb chop/chops in bowl just large enough to hold it/them. Whisk oil, vinegar, garlic and rosemary in a small bowl. Cover and put in fridge for 2-8 hours. When ready to use, bring to room temperature. Heat small amount of oil in skillet large enough to hold the lamb chops. Sautee about 5 minutes on each side (until medium-rare). I served them with some warm white beans (with a little vinegar, lemon and oil in them) and sauteed grape tomatoes over a bed of arugula. My mother is a crushed red pepper fiend. Crushed red pepper is a very popular condiment in Basilicata. Used simply with pasta, garlic, oil, parsley and cheese - the pepper makes the a simple dish come alive and wards off the chill. Grandma made her simple pasta with pork or possibly wild boar or goat back "in the old country." My mother would add it into seafood. And so I did. This simple pasta with shrimp, tomatoes and red pepper flakes is easy, warming for the winter and lets you savor each ingredient. Grandma appreciated tomatoes. They had to brought up to the mountains every sumnmer, where they would dutifully can them. Life in New York City was actually easier. In a large skillet (at least 12 inches) warm your olive oil on low. (If you happent to have red pepper oil, cheat and throw it in - most delicious). Add your red pepper flakes and garlic (a trick I adapted from Michael Symon). 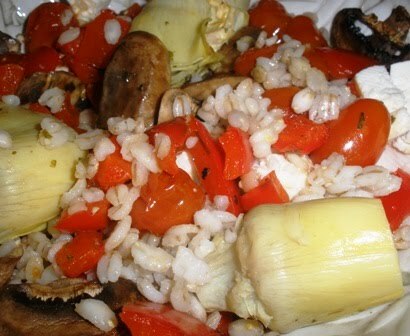 Gently heat the red pepper and garlic in the oil for as long as it takes for the water for the pasta to boil. 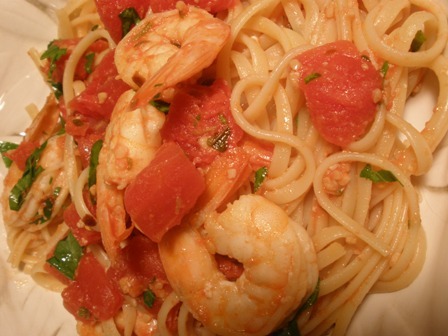 When you add the pasta, add the shrimp to the skillet. Raise the heat to medium. Let the shrimp gently simer in the oil. 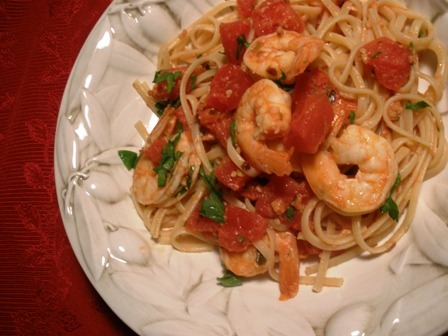 When it start to turn pink, turn the shrimp over and add your can of tomatoes. Drain your pasta and it to the skillet (or if there's not enough room, gently mix in a serving bowl). Scatter fresh parsley. Serve. Be warm. Savor. Use small, fresh tomatoes if you have. Add or subtract amounts. Use scallops. Swipe linguine for spaghetti or even angel hair or a wider fettucine. When our ancestors came here, they "made do." Please do the same. The theme for Eat. Live Be. For a better 2011 this week is "Baby it's cold outside." And in Minnesota it is. This is when I turn to soups for sustenance, for guilty pleasures and comfort. Nothing brings you closer to the hearth than stracciatella. Known as the Italian egg-drop soup, a little semolina, Parmesan and eggs are swirled into clear broth creating cooked little rags that curl up in the same way I want to curl up in the winter. This is ripe for additions/changes. I (boring alert) watch cholesterol so sometimes use 1/4-1/3 cup of egg whites. Sometimes I add the semolina. In my old, wicked ways - I was in danger of having a little broth with my melted Parmesan - so take the amounts as gentle suggestions. And in my two-year journey to be more vegetable-centric, I always add spinach or chard at the end. In a small bowl, whisk eggs, Parmigiano-Reggiano and semolina. Add egg mixture to broth and whisk constantly until the eggs turn to flecks of little white rags and the Parmesan is melted. Add your green and stir until they are just wilted. Serve. Two weeks into the challenge, life is - well - challenging. I have yet to sacrifice flavor or huge desires because of a "diet." I am not on a diet. I am midfully eating. (Right now I am mindfully eating the smallest chocolate chip cookie known to man.) Next week's challenge is (gulp) "What is your biggest challenge?" I may have to address that I am not doing well in the "being succinct" category. Or maybe I need to post more than once a week. All food for thought. And my thoughts turn to food. If you want to join the challenge. click on Eat. Live Be. For a better 2011. Or find them on Facebook. 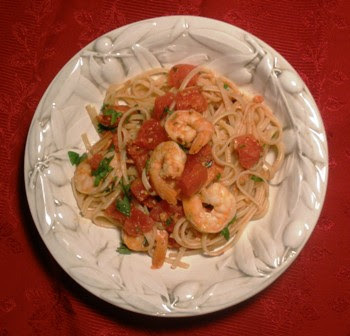 I will be sending the pasta with shrimp recipe to Girlichef for Pasta Presto Nights (my favorite nights). And if you think you cannot lose weight eating pasta - think again. I am doing it! Weight? Wait! Don't tell me! Eat. Live Be. 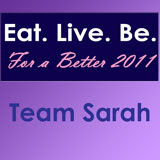 for a better 2011. On November 11, the day before my daughter's birthday and two weeks before the start of the "Eating.... make that Holiday Season," I stepped on the scale and decided enough was enough. I have been "up" 8 pounds every year for five years. We don't have to say the number. Everyone knows their multiplication tables. "Why are you going to Weight Watchers, now? Just before the Eating.... make that the Holiday Season begins? Why not wait for January?" I was asked. Because if I can eat mindfully during November and December, I know I can continue the rest of the year. And it's not a New Year's resolution to fall by the wayside by January 10. 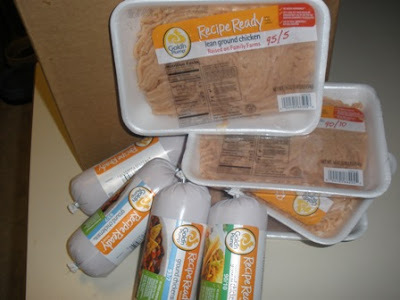 Gold n Plump was generous - eight pounds of ground chicken came to my doorstep. 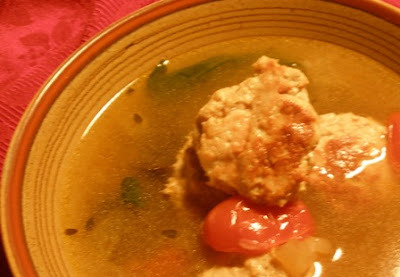 I posted the fact on Facebook and Pat from Mille Fiori Favoriti commented, "I see Italian Wedding Soup in your future." 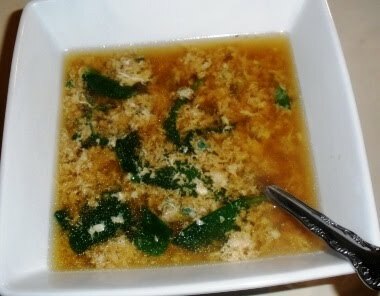 And so it came to pass that I made Italian Wedding Soup with ground chicken instead of beef. I played with my meatball recipe. No more bread soaked in milk. 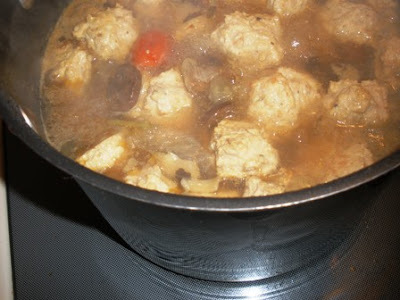 Bread crumbs were added instead to give the meatballs more heft. Italian Wedding Soup is native to many regions in Italy - my gradmother was from poverty-stricken Basilicata and made hers with pork. But the important thing is the marriage of the meat and the vegetables in the broth. I've made it many times with ground turkey and knew the ground chicken would work. 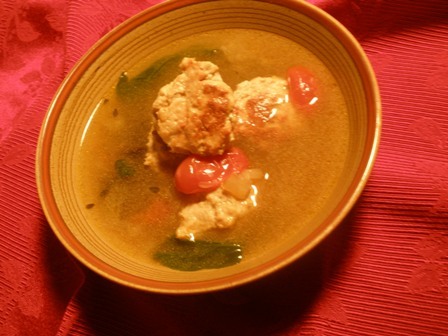 Italian Wedding Soup is usually made with itsy-bitsy, teeny-weeny meatballs. My chicken mixture was too sticky (I could have added more bread crumbs - but I really wanted them light and meaty and not rock solid) so I (in all my wisdom and lack of patience) made giant honkers of meatballs that may make Italians shudder but were nonetheless delicious - and yes, light. I roasted fennel, onions, garlic, grape tomatoes and some mushrooms in the oven at 350 degrees F for about 20 minutes. I then threw the roasted vegetables in a stock pot, added about 4 cups of water and simmered all for an hour. I later added chcken broth but in my new "mindful eating" stage I wanted to make sure this soup was laden with vegetables. Then, I did throw the edgy-looking meatballs into the soup, simmered for 30 minutes, stirred in a bag of spinach and was done. And happy. And was sated without being full. And then I turned to fish. Kevin at Closet Cooking had a Halibut with a Garam Masala Halibut with Curry Tomato Sauce (I love cooking from blogs) that looked warming and comforting. When I discovered halibut was $24.99 pound, I picked up tilapia! And it was indeed warming and comforting. Key ingredients to cooking during the Minnesota winter. The ground chicken became a taco salad. I quickly discovered that ground chicken is a chameleon and soaks up seasonings well. If you want your ground beef to impart its own flavor - then ground chicken is not your best bet. 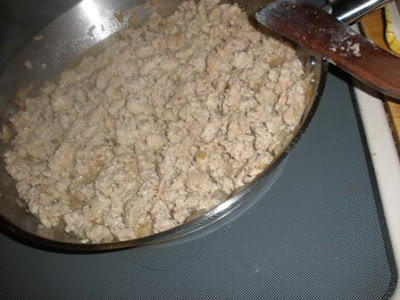 But if you are doing a dish that has strong seasonings, ground chicken works just as well. And then the family announced I hadn't made Sloppy Joe's in years. 'tis true. I haven't. So I did. With the Gold n Plumps ground chicken. I like using something that gives me 33% less fat than beef. After all, I am trying to get rid of about 33% of my body. I exaggerate a bit. So now you know, I am not succinct and exaggerate. After browning the ground chicken, the family wasn't sure about the lack of "brown" in the browning process. 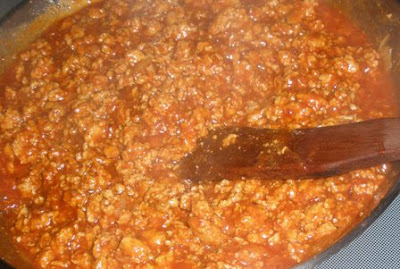 And through the magic of cooking - the ground chicken turned into a Sloppy Joe! Gold n Plump has many recipe varieties. Fresh or frozen and ranging in price from $2.99-$3.99 per pound. The chicken is all-natural and raised on family farms. I do like that. For the past three years, I have gotten 75% of my meat from a local, organic farmer. I will continue to do that. But I do supplement - particularly in the winter. After using ground turkey instead of ground beef for ten years, it's been tasty to discover ground chicken as an alternative in many dishes. And when I do supplement from the grocery store, I look to continue to support local farmers and products. I can do that with Gold n Plump. 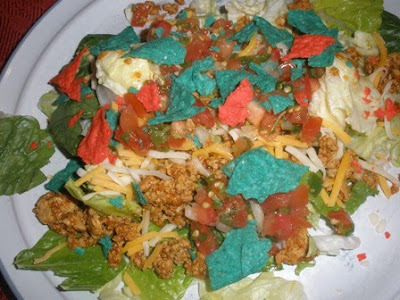 Find additional recipes for their ground chicken here. Disclosure: I was indeed the grateful recipient of ground chicken products from Gold n Plump but my opinions are always, most decidedly, definitely my own. I do receive many offers and tend to accept those where I have a gut feeling - I will like it! I have thrown in my hat joining many bloggers is Eat. Live Be. for a better 2011. I've already lost a stone. I'm down 1-1/2 sizes. (Which means I can wear clothes that are too tight or jeans that fall down when I walk - both scary alternatives.) I am committed to Weight Watchers until the summer, so why join something else when I'm not really a joiner? For support, community and the knowledge that I will hit a brick wall. I had lasagna and buche de noel for Christmas (and gained the requisite pound). I intend to celebrate Carnevale with bugies. And will have Pizza du Grane for Easter. There they are. My three Magi. Kings who brought gifts to baby Jesus on Epiphany. Only in my case, it was three Queens. And it was New Year's Eve. Can you stand one more story - if I am succinct? And I promise a delicious recipe at the end? And if you prefer the recipe to the stories, just scroll down! I am entrenched in my Italian childhood - I grew up surrounded by Gresios and my father was the honorary Italian. Who had a Scottish mother and a Ukranian father (who is cousin to Otto Schmidt, the Russian explorer which was always a cool fact for me). I love the Legend of the three Magi. It has special meaning for me. Memories are part family lore and part shadows in your brain. 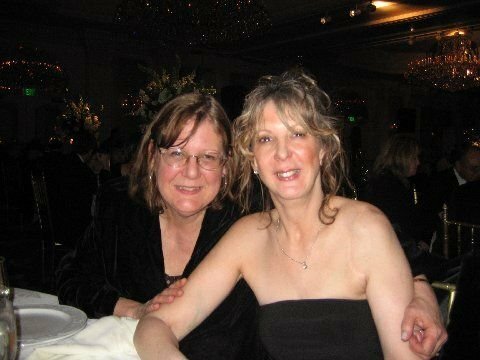 I have heard the oft-told tale of me sitting on Santa's knee and asking him to bring home my sister from the hospital for Christmas. I am told Santa teared up. And looked helplessly at my mother who was astonished. I was 4-1/2. And I have no memory of that. I do have the memory of my six month old sister coming home for Christmas and our Christmas together. And then in a flash - she was back in the hospital. Very sick. My young brain was well aware of that. I was funnelled to the Italian aunts. The week was a blur. Children my age couldn't visit family members in the hospital in those days. Parents couldn't stay over night. And so went Christmas week. New Year's Eve came. My parents were both home. Open presents lay neatly under the tree. My sister's baby toys awaited her return. My parents were considering take-out pizza for the greeting of the New Year. We lived in a small one-bedroom apartment in Queens. My parents slept in a hide-a-bed in the living room and I had the large one-bedroom which I was to share with my sister. When the doorbell rang. On the other side of the door were my two great-aunts - Aunt Elsie and Aunt Helen. They lived in the Bronx and it was quite a trek to get to Queens from the Bronx. Two subways and two busses. So you can understand that Aunt Elsie and Aunt Helen never just "showed up" on our doorstep. But there they were outside the door, on a snowy New Year's Eve bearing gifts - just as the three Magi had done. Only they arrived six days after Christmas instead of 12 days later. They each carried two sturdy shopping bags and Aunt Elsie was balancing a small bag. They knew my parents did not have the heart to ring in the New Year with their baby in the hospital. 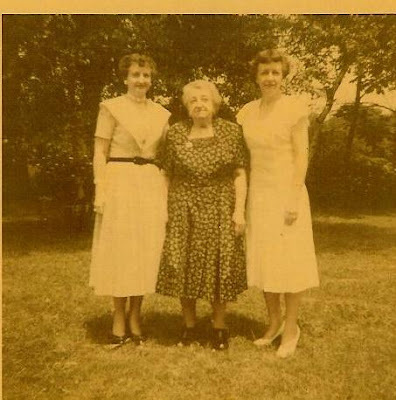 Aunt Elsie and Aunt Helen had devised a plan with my great-grandmother. A plan to lift their spirits and welcome the New Year with optimism. They walked into the dinner-less kitchen and took over. Aromas of spice filled the air. My parents stood immobile. Stunned. "Come on, get the oven going. This will need to be reheated a bit. Set the table. It's New Year's Eve. Don't just stand there!" And from the bags emerged a large sauerbraten roast. 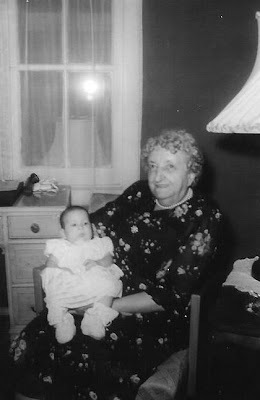 A roast that had marinated for days under the careful tutelage of my great grandmother. It was cooked to perfection. A bowl filled with red cabbage came next. And then the dumplings - that got my four-year old attention. I knew what I liked to eat and I loved dumplings. And then the gingersnap-spiced beef gravy emerged. Savory and sweet. This was Christmas all over again. As the preparation for rewarming the dinner began in earnest, my Aunt Elsie let me see what was in her small bag. I took a sniff. And pulled back. It was definitely not to my liking. Which was a good thing. It was a chilled pitcher of Manhattans - concocted in the Bronx and hand carried to Queens. Age four was definitely not the time to start having a cocktail hour. "This pitcher got attention on the subway, I can tell you that," agreed my aunts. "There was a gentleman who kept trying to peek inside. But I shooed him away." And the aunts poured a cocktail for themselves, for my parents and a glass of milk for me. We toasted my sister, her health, the New Year and my great grandmother who devised the meal but could not make the long journey from the Bronx to Queens. My aunts were an oasis. A balm for frazzled nerves. A small refuge from the sadness that engulfed my family. My great-grandmother was blind but her loving hands left imprints on the meal. It was she who guided the sauerbraten meal. She who tasted and formed the dumplings and it was she who directed the cooking according to taste and aroma and feel. Her presence was real. She was with us during that meal. Hours passed and we were sated and warmed. My aunts had to leave. They would not think of staying over night although my parents would have happily let them sleep in the hide-away bed. They would not leave my great-grandmother alone. And the snow was now falling in earnest. My father insisted on driving them and after protestations, it was agreed that he could drive them to the subway station. My aunts were formidable. They could take care of themselves on the subway on New Year's Eve. My father first brought them to the hospital where they visited my sister (after visiting hours! oh the nuns who were nurses must have fluttered!) and then went home as planned - via the subway. Before they left, there had been many hugs. When my mother and I were alone, my mother found a crumpled ten dollar bill in her apron pcket. Sneaked in during a hug. 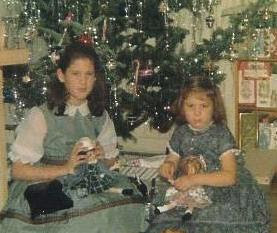 And under the tree were two Christmas presents - one for me and one for my sister. My three aunts, my Magi who brought gifts on New Year's Eve. Gifts of food, gifts of drink, gifts of strength and gifts of love. My sisters gift remained under the tree. The tree would soon be a memory. But the gift was waiting for her when she finally did come home. A few years later - a happier Christmas even if we look very serioso. And today (my sister is the stunning one). And the recipe: This was my father's birthday dinner every year. I have photobooks filled of us toasting him and no photo of the actual roast. We did not make the dinner last year, but I will this year. And I will use Great-Grandma's recipe. *Great Grandma's Tip: Use a good roast - don't go for chuck here - it will shrink away to nothing. It's a celebratory dinner! Place in a non-reactive bowl. Add vinegar and then if necessary, add some water to completely cover roast. Add bay leaves, peppercorns, cloves and parlsey. Cover and put in fridge for 3-4 days turning the meat once each day. Drain off liquid and reserve for sauce. Rub meat all over with seasoned flour. Add onions, carrots and 2 cups of the spiced marinade. Cover and gently simmer for 2 hours - until the meat is tender. Remove meat to platter and cover to keep warm. Make gravy in the same pot or pour into a saucepan. Add gingersnap crumbs and sugar to the liquid. Simmer for ten minutes. Taste and add salt and pepper if desired. Pour sauce over meat and serve. Serve with potato dumplings and red cabbage. That sauerbraten meal was a turning point in our family's life. `In 2011, remember all the kindnesses.